Dead pigeons and chandeliers | Cultura-plasmic Inc.
During October 2015, a new interactive work called Dead Pigeons and Chandeliers was displayed as part of the Poor Door exhibition at A-Side B-Side gallery in Hackney. The work depicts one of the mansions on ‘Billionaire’s Row’ that was left derelict for twenty years. In this particular property, the water had never even been turned on despite the house being complete with decadent fittings and furnishings. Ten artists joined forces for this show which campaigned for affordable housing through painting, photography, sculpture and performance. Rough sleeping has risen in London by 37% in the past year contrasted with the 22,000 empty homes in the Capital that are sitting empty. These figures contradict Mayor of London Boris Johnson’s previous pledge to end rough sleeping by 2012. Rental prices for a one-bed flat have risen by up to 30% in Greenwich and Ealing, whereas house prices have risen 18.4% in one year. The Joseph Rowntree Foundation suggests that by 2040 private rents will rise more than twice as much as incomes. The title of the exhibition refers to the furore over the development at One Commercial Street in Aldgate, which was built with two separate entrances; luxury marble floors, chandeliers and concierge for city workers and a side-alley door for housing tenants. This divisive phenomenon seems reminiscent of the Victorian era yet these so-called ‘poor doors’ are a growing trend in new housing developments in London. The exhibition also took inspiration from Jack London’s 1903 first-hand account of living in the East End, The People of the Abyss. The book documents the damp and overcrowded conditions that 500,000 Londoners had to endure in Victorian England, and went on to influence George Orwell and his writing of The Road to Wigan Pier. 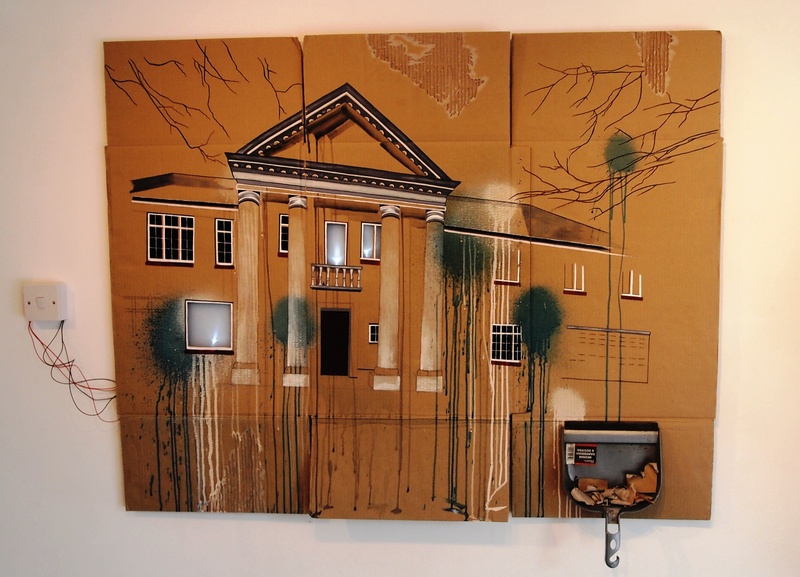 The show was curated by artist-activist Tinsel Edwards whose artwork features in Banksy’s personal collection when one of her paintings caught his eye in 2006. Tinsel Edwards: “I’ve been making paintings in response to the housing crisis for a few years now, as time goes on the situation in London gets worse and worse. For The Poor Door exhibition I wanted to seek out and bring together a group of artists who make work about housing, to create a collective response to what is happening in the hope that together our voices will be louder. Artists: Alison Berry, Rebecca Byrne, Tinsel Edwards, Mars Gomes, Kin, Lee Maelzer, Reena Makwana, Society for the Protection of Admirable Rubble (with Brian Guest courtesy of Calum F Kerr), Tom Rizutto, Julia Russell.